The Eagles had already won four games by a total of four points in 2012. Sunday in the Steel City vs Pittsburgh, they were seconds away from their third one-point win of the year. Instead, their defense was unable to stop Ben Roethlisberger, Rashard Mendenhall, and the Steelers late, as Pittsburgh marched down the field to kick a final play field goal to pull out a 16-14 win. 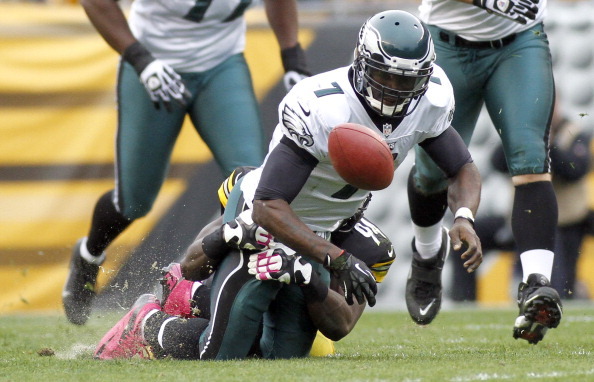 The Eagles had taken a 14-13 lead on Michael Vick to Brent Celek touchdown from two yards out with 6:33 to play. It was a huge drive that covered 17 plays and 79 yards, and took 8:08. The Steelers bounced right back, going 64 yards in 14 plays, and Shaun Suisham nailed a 34-yard field goal at the buzzer to send the Eagles home at 3-2 when it looked like they could escape 4-1. Pittsburgh outgained the Eagles 343 to 246, but it was two drives by the Eagles, the first helped by penalties that eventually allowed them to gain the one-point lead. Vick fumbled the ball at the goal-line early in the game, and for the most part the Steelers D held him in check. He went 20-for-30 for 175 yards with two TD’s and a QB rating of 104.2. The Eagles, a week after going off in the ground game vs the Giants, were held to 78 yards on the ground. The Steelers run game went for 136 yards on 31 carries, putting up 4.4 yards per carry. The Steelers built a 10-0 halftime lead, but the Eagles came roaring back with a touchdown midway through the third when Vick hit LeSean McCoy with a 15-yard TD to make it a 10-7 game. Suisham kicked a 34-yard field goal 9 seconds into the fourth quarter to make it a 13-7 game, before the Eagles went on their long drive to take the one-point lead. The win puts the Steelers at 2-2 on the year. Philadelphia hosts the Detroit Lions next Sunday at 1pm.